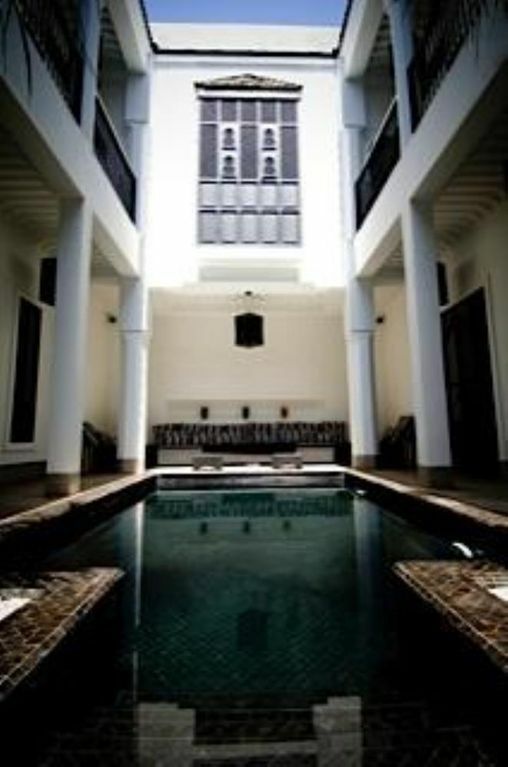 (Text automatically translated) Contemporary Riad 450m ² with Moorish architectural details, the very stylish decor. Patio of 60m ² with pool and open living, 3 bedrooms and 3 suites, each with a bathroom with wc .. 150m ² terrace with Jacuzzi pool, sun beds and mattresses, lounge and dining room. Massage room (massage on request) and gym. Reversible air conditioning in all rooms. Quiet and well location (BAB DOUKKALA, MEDINA, near GUELIZ). Breakfasts included. From 2500 ? / week (riad) or 70 ? per night for a double room and ? 90 per night for a suite. (Text automatically translated) Near the Riad restaurant Fouquet THE CASINO'S BARRIER THE ARAB HOME. If you stay more than 3 days, we are at your disposal to organize trips according to your wishes. In Marrakech, you have everything nearby, golf, quad bikes, horse riding or camel rides to discover Marrakech and its surroundings and why not a walk in the dunes of southern Morocco ... After a busy day we can also offer sessions well-being at home, organize a dinner with belly dancers. Our staff is at your disposal. Quote on request functions desired activities. " acompte/arrhes à la réservation Nous demandons 20% d'acompte à la réservation.